The advocacy publication for disabled video game enthusiasts has named Star Wars: The Old Republic its Mainstream Game of the Year, meaning it is the most widely released title that also is most accommodating of gamers who have different needs to enjoy full-featured gameplay. 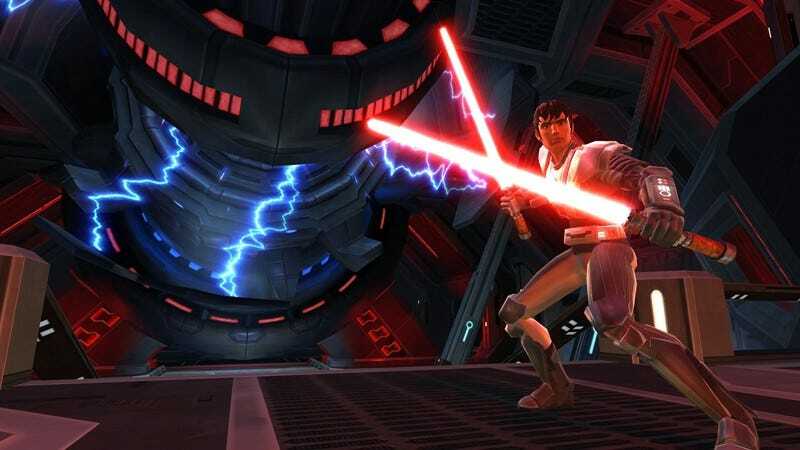 AbleGamers praised SWTOR for "many accessibility options such as full subtitles, queue-able actions, multiple action bars, area looting, auto looting, and built-in mouse sensitivity." Other global design traits included the way characters face the enemy they're engaging, full control through the keyboard or mouse and, near and dear to my heart (or eyes), a colorblind-friendly minimap. Also, AbleGamers cited the "unintentional accessibility" delivered by the games companion features. "These NPC characters which accompany the player through most of the game provide support to those who need it without forcing them to request help from other players," AbleGamers wrote. Building a game inclusive of players with special needs is often a tricky proposition. While no one doubts that it is a kind and considerate thing to do, it often requires extra developmental cost, and usually comes as a control set optimized for a minority of the gaming market. That's why these accommodations, made by past honorees Dragon Age: Origins and Forza: Motorsport 3 (and, unrecognized but no less admirable, MLB 11 The Show) merit applause. "What makes this game so special is that the developers took the time to include so many accessibility options while up against tight deadlines in such a highly anticipated title," AbleGamers wrote, conferring the award to both BioWare and LucasArts.